Now three of the most iconic Disney villains of all time are available in the Disney Signature Collection Villain collection. Ursula, the evil sea witch from The Little Mermaid, the Evil Queen from Snow White and the Seven Dwarfs and The Beast from Beauty and the Beast. All three are spellbinding in their signature outfits that are recognized from their timeless tales. Ursula dominates the sea with her large, deep-purple body and eight curved tentacles, wearing her golden seashell necklace that captures and holds Ariels beautiful voice in the film. The Evil Queen looks terrifyingly beautiful in her dramatic cape and gown and golden tiara, clutching her iconic poisonous apple. 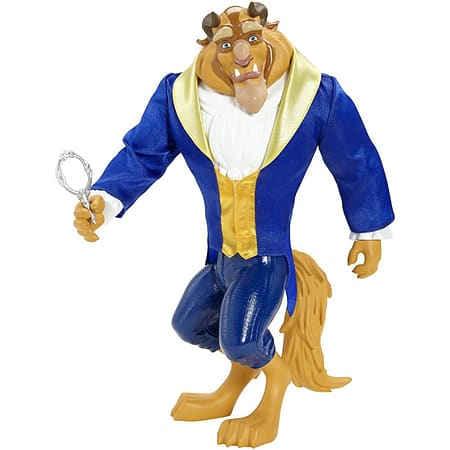 The Beast captivates in an iconic formal royal blue and gold coat, stretched over his tail, 'fur' and massive claws! He also comes with his enchanted mirror. Each of these Disney Villians Classic Signature Dolls have been crafted with exquisite detail, making these true-to-the-movie dolls collectibles that both mums and daughters will treasure for years. Dolls cannot stand alone. Each sold separately. Ages 3 and older. The most irresistible creature of all time is now available in the Disney Classic character collection! The Beast comes ready to captivate in iconic, formal coat of royal blue and gold, stretched over his tail, 'fur' and massive claws!